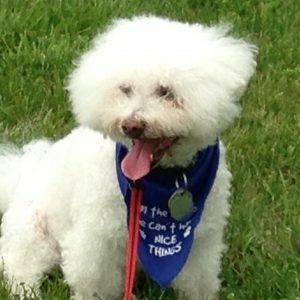 Dinah is a calm, confident Bichon Frise. She focuses closely on each child who visits with her and is always gentle. Nancy tutors kindergarten students individually in math. The children work solely with Nancy for a short time, and then get to sit on a blanket with both Nancy and Dinah together. It’s both a wonderful reward for the children as well as a chance to learn how to safely and kindly interact with an animal. Dinah greets each kindergartener by sticking out her right paw to shake hands. She allows the children to brush her fur, then does a huge body shake. The kids learn why she does this – to position her hairs to stand up in order to insulate her body. Some of the children fear dogs because they have only known them as guard dogs. The team discusses what to do when a strange dog approaches. Other times, a child just needs a hug – and Dinah always obliges. Thursdays are spent at a kindergarten class in a school in north Minneapolis where poverty is prevalent. Dinah is a huge celebrity there, and may even be a modern legend. Students have told staff members that she has cured their allergies, and will place her paw on mispronounced words when students read to her. The team has also visited at senior care centers. Dinah is small enough that she can lie comfortingly on a lap or next to someone on a bed, providing warmth and comfort. At home, Dinah is active and playful. She races through the house, growling and charging. She loves to wrestle with the other household dogs. Dinah is not interested in toys, but loves treats and knows just what needs to be done to earn one. She also makes plenty of time for sleep and will nap with anyone who lies down. At the end of the day, Dinah and her two fellow dogs enjoy time on the couch, cuddled next to legs, for the television news.